Take Your Child to a Bookstore Day began in 2010 when my children were little and I was taking them to story hour at my local bookstore every week. The kids got a book, I got a latte. (Sometimes I also got a book, but with two small children, my reading wasn’t up to its usual pace). Then I started musing about cleaning products. I’m not changing the subject here. You may know the ones I mean: paper goods, soaps and sprays made with ingredients that are safe even if you spray them directly in your eye. Or your young child does. They’re called Seventh Generation, which is the Iroquois Indian concept that anything we do should be sustainable for the next seven generations. I wanted bookstores to be there for at least seven generations, too. So that during the busy, tiring, hilarious early years, my children’s children’s children could experience the pleasure of seeing their little ones bouncing around on the carpet only to be caught up by a funny line or a beautiful illustration, and sit in quiet rapture, if only for a moment. I sent a post to a mystery listserv I’m part of. “We should have a Take Your Child to a Bookstore Day,” I wrote, and before you could say, “Don’t spray that stuff in your eye!” the avid mystery fans on the list had taken my idea viral in blogs and status updates and maybe a few early-adoptive Tweets. Within two weeks, 80 bookstores were celebrating on the first Saturday of December with special events such as author signings, gingerbread cookie decorating, balloon giveaways and dozens of other creative ideas. That summer, my husband and I packed our kids in the car, and drove cross-country, visiting fifty bookstores, bringing bookmarks, and sharing news about the Day. Since then Take Your Child to a Bookstore Day has grown. Last year it was celebrated by over 500 bookstores in all 50 states and five foreign countries. The first Saturday in December has become a special Day at bookstores everywhere that hang a poster in the window, give out bookmarks, and plan special celebrations for families in their stores. This year we have a brand new board of directors, who are taking TYCBD to national non-profit status. Once that is established, many things are in store, such as field trips to bookstores for kids in at-risk areas. When I think about a child who has never owned a book getting to take one home, it brings me back to being young myself, and dependent on stories to carry me away. The possibility of giving one child or ten thousand the same joy is something I yearn to make happen. You don’t have to have a child to celebrate TYCBD. While at first we toyed with the idea of calling the holiday “Take a Child to a Bookstore” we quickly put the kibosh on that. (What a difference one little article makes!) But whether you bring a niece, grandson, friend’s child, or simply the kid inside yourself to a bookstore, the main idea is to spend the first Saturday in December in a palace of books. There is a movement afoot in our culture that ties in to Take Your Child to a Bookstore Day. The Suessian word “locavore” has entered our national vocabulary. We’re beginning to think about a return to Main Street, and the price we pay when our kids have to be stuck in a car and driven to a store just to buy a candy bar, some school supplies, or the aforementioned biodegradable cleaning products. 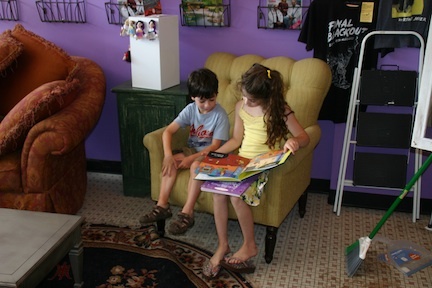 A bookstore is a place for kids as well as adults, at the heart of any thriving community. It’s a place to exchange ideas, find the next book that will fuel a dialog at home, and entertain our children without a screen or device. This fall, please find a bookstore near you and ask if they’re celebrating Take Your Child to a Bookstore Day. If they’re not, perhaps you can propose the kind of activity you know your child would enjoy. And on Saturday, December 7th, take the whole family to a bookstore. I think you’ll be glad you did—and so will the generations to come. Thank you, Blue Moon, for always shining a light on what is most important, and sharing your stories with the world. This is mine, and I am proud you made me a part.